The person willfully and intentionally gives a statement. The individual involved in the investigation of perjury under 18 USC § 1622 is the prosecutor. It is upon the prosecution to prove that such statement given meets the elements required for perjury. It is also incumbent upon the prosecution to show that the defendant intentionally made the statement with the knowledge that the same is false. The prosecutor may also show evidence of conspiracy and can also prove that the act resulted in an obstruction of justice that adversely affect the judicial proceeding and the prosecution of the case. 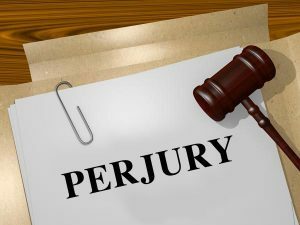 When guilty of perjury under 18 USC § 1622, the penalty involves a fine or prison term of not more than five years or both. The federal sentencing guidelines may also impose a higher penalty if the consequence of the commission of the crime results in obstruction of justice. This usually occurs when the false statement is given during the course of an investigation or during a prosecution. The penalty of imprisonment may be increased with an additional of four more years, but usually not any more than that. Long-term prison sentence can sometimes be avoided in white collar crimes pursuant to 18 USC § 1622. Wall Street Prison Consultants specializes in helping federal and state offenders to obtain sentence reductions through programs that can help provide alternative solutions to long term incarceration. Our consultation services employ investigative and research processes to assist inmates and their lawyers in finding the best solution and alternatives available to reduce prison terms of an inmate. Discuss possible solutions to your issues today.